Get A WE WILL NOT COMPLY Sticker! Get A WE WILL NOT COMPLY Button! Get A Gun Right’s Are Women’s Rights Button! 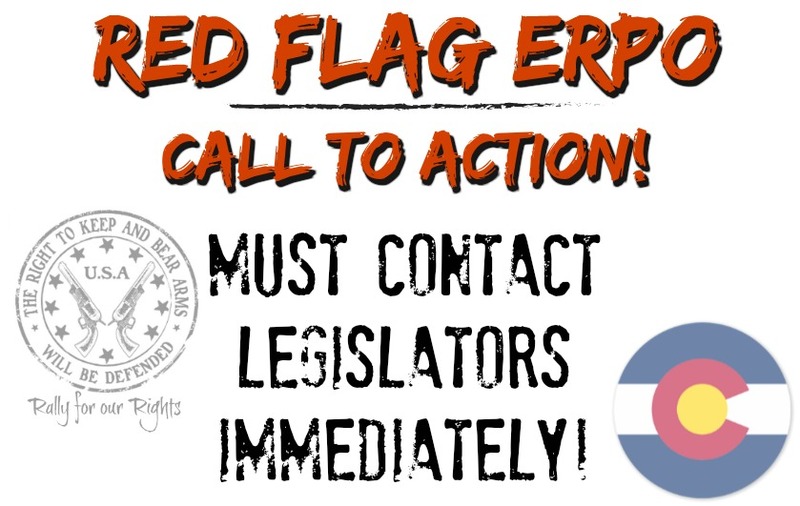 “Red Flag” ERPO Heads To FINAL VOTE – Contact Senators NOW! 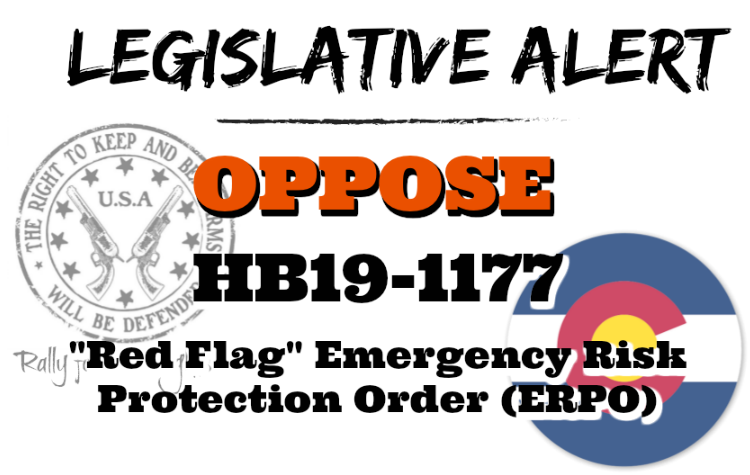 HB19-1177 “Red Flag” Emergency Risk Protection Orders ERPO will head to a final vote in the Colorado State Senate any day! This is one of the most critical times to make contact with lawmakers – and we need you to do it today. State Senate Democrats only hold a TWO SEAT majority. We need all hands on deck right now! Aside from being grossly unconstitutional, this bill is downright dangerous. Scroll down to get a quick run down of all that is wrong with it. These make excellent talking points when writing emails to legislators. And send to this entire email list as well. This year’s bill is being called an “Emergency Risk Protection Order” or ERPO in an attempt to lose the negative “Red Flag” reputation. It is also being pushed more than ever as being about suicide prevention. Don’t let any of it fool you. The devil is in the details; it’s in the 30 pages of bill language. You can read a complete break down of these 30 pages here, as well as watch a video going through the language line by line. • Almost anyone can request an ERPO without even showing their face or providing their address. The definition of “family or household member” is so broad it includes ex-lovers who you have never even lived with! Or someone *claiming* you once had an affair. And even old roommates. • The initial report and hearing can be done over the phone, all while the accused is completely oblivious proceedings are taking place to have his or her firearms confiscated. There is no due process at this first hearing – which is the hearing where permission is given to confiscate gun! 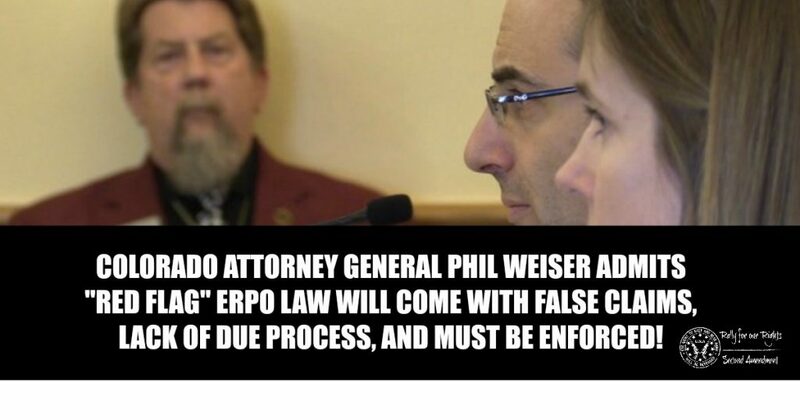 Even Colorado Attorney General Weiser admits to the lack of due process. Watch his testimony here. • The first time the accused learns someone has reported them will be when local law enforcement shows up at their door with an order AND a search warrant prepared to raid your home – while the accused never even committed a crime. This search warrant is a BRAND NEW type of warrant that is created in the bill – a gun owner specific civil search warrant. Read all about that here. • 14 days later is the first time the accused will have a chance to defend themselves against this non-crime. The burden of proof will fall on the accused, not on the petitioner who can actually provide affidavits rather than attend court! • The guns will be confiscated for 364 days, during which time the accused only has one opportunity to ask the courts to lift the order. • There is zero accountability for false accusers. In fact, the filing fee is $0! For comparison, requesting a Temporary Restraining Order in Colorado is $97. Attorney General Weiser also admitted false claims will be par for the course. Listen to his statements here. • This bill is being touted as a “suicide prevention” bill, when in fact, the fear of having your firearms confiscated will make people terrified to ask for help when they need it, and will undoubtedly escalate situations rather than deescalate them..
• It is so rife for abuse, it can easily be used by someone’s stalker or abuser to have their victim disarmed – legally. • The ERPO will go on a person’s permanent record EVEN if it is dismissed, meaning it will show up on background checks, etc. Last Friday, March 15th, after nearly ten hours of testimony, HB19-11477: “Red Flag” Emergency Risk Protection Orders ERPO bill passed out of the Colorado Senate State, Veterans, and Military Affairs committee on a 3-2 party line vote. It will be headed to the Senate floor for a full vote in the coming days. Right now it is critical we contact our State Senators and ask them to oppose this bill, HB19-1177. You can find contact info here, or use the copy/paste email list provided below. During this marathon hearing, we heard testimony after testimony from gun owners discussing everything from personal experiences of domestic violence and stalkers – and fears this law would be used to disarm victims, to recounts of SWAT escalating suicide situations. Concerns the “mentally ill” label in the bill could be used against those in the LGBTQ community, to sound Constitutional arguments. The testimony was powerful – and on point. Bill proponent, Douglas County Sheriff Tony Spurlock gave a bizarre and unraveling testimony which you can watch here. But besides Spurlock, one of the most alarming testimonies was given by Colorado State Attorney General Phil Weiser. During his testimony, he nonchalantly admits this bill will be imperfect, that false accusations are just par for the course, and he oddly compares it to copyright infringement claims. I have no idea how he thinks removing copyrighted material from a website based on false claims is at all the same as confiscating an innocent person’s firearms. But apparently he does. He then goes on to make it clear, should this law pass, sheriffs and law enforcement must enforce it until it’s determined to be unconstitutional in the courts, which would be years. Watch the the video below for his testimony highlights. His full testimony can be found here. Buried deep inside the 30 pages of Colorado’s HB19-1177: “Red Flag” Emergency Risk Protection Orders bill language is one of the most frightening – and unconstitutional – aspects of the proposed legislation. They are creating a new type of search warrant in the state that would be specific to gun owners only: a civil search warrant. This civil search warrant would be issued along with the initial temporary ERPO, meaning the very first contact between law enforcement and the accused would be a search of the home with the goal being to confiscate firearms. Currently, with very few exceptions, search warrants are only issued for criminal reasons. According to mountains of existing case law, search warrants are granted by convincing a neutral and detached magistrate that they have probable cause to believe that criminal activity is occurring at the place to be searched or that evidence of a crime may be found there. Anything that strays from this definition is a blatant violation of the Fourth Amendment. 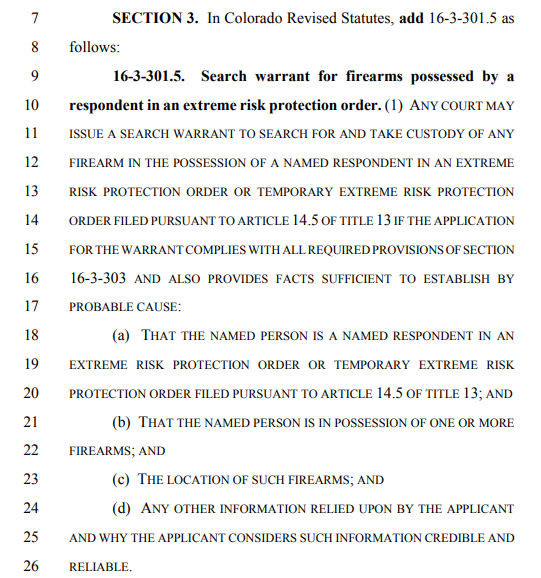 Considering ERPO’s would be issued based on accusations by a petitioner over the phone with a $0 filing fee and only requires substantial evidence, this new gun-owner-specific search warrant is more than troubling, it is downright dangerous. Especially when factoring in who can petition the court for an ERPO, that being: a family member, a spouse, a girlfriend/boyfriend, an ex-spouse, an ex-girlfriend/boyfriend, a roommate, a former roommate, anyone the accused has been intimate with even if they have never resided together, grandparents, stepparents, stepchildren, step-siblings, and anyone in law enforcement. The accusations can range from fear someone will harm themselves, or harm others (and not necessarily with a firearm), to simply owning a gun or talking about purchasing one. 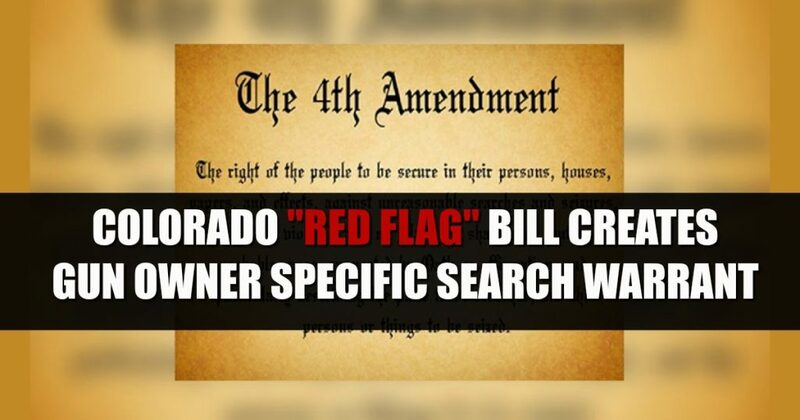 I’ve been writing and hitting the airwaves talking about Colorado’s proposed version of a Red Flag Law extensively since the bill was introduced last month, and have said again and again it is one of the most dangerous and overreaching versions I have seen across the country. This new gun-owner-specific civil search warrant is part of the reason. Nevertheless, I decided to research if any other states have anything similar tied in with their Red Flag laws, and came up empty handed. In fact, during my research into civil search warrants, the only examples I could find of them were with intellectual property, and even then they require clear and convincing evidence in order to be granted. HB19-1177 only requires substantial evidence to have the warrant issued, and it is not intellectual property being seized – it is real property that is constitutionally protected under the Second Amendment. So, what’s the difference between “Substantial” and “Clear and Convincing”? Substantial Evidence: Substantial evidence is “such relevant evidence as a reasonable mind might accept as adequate to support a conclusion.” This level of evidence is often used in administrative cases such as DMV hearings, or determining unemployment benefits. Clear and Convincing: The clear-and-convincing-evidence standard goes by descriptions such as “clear, cogent, unequivocal, satisfactory, convincing” evidence. Generally, this standard is reserved for civil lawsuits where something more than money is at stake, such as civil liberties. Scary stuff, right? 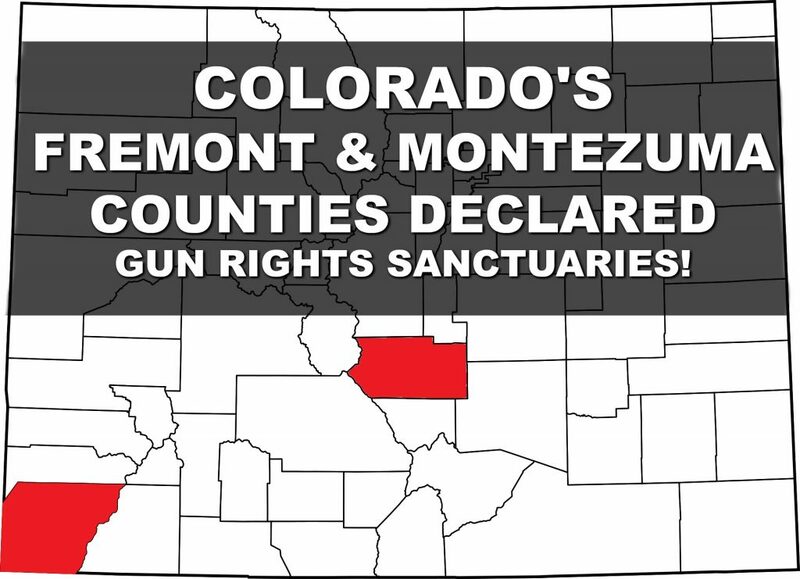 THIS is why nearly half the counties across Colorado have declared themselves Second Amendment Sanctuaries, with their sheriffs leading the way. Most county sheriffs read this bill and say “No Way”. They understand how unconstitutional it is, as well as how dangerous the outcomes can be for both those being accused and law enforcement officers who will be expected to raid someone’s home based on the same level of evidence needed to approve an unemployment application which can be presented by a scorned lover over the phone for $0. Fourth Amendment to the United States Constitution: The right of the people to be secure in their persons, houses, papers, and effects, against unreasonable searches and seizures, shall not be violated, and no Warrants shall issue, but upon probable cause, supported by Oath or affirmation, and particularly describing the place to be searched, and the persons or things to be seized. What else is so bad about this bill? Well, nearly everything. • The initial report and hearing can be done over the phone, all while the accused is completely oblivious proceedings are taking place to have his or her firearms confiscated. • The first time the accused learns someone has reported them will be when local law enforcement shows up at their door with an order AND a search warrant prepared to raid your home – while the accused never even committed a crime. • 14 days later is the first time the accused will have a chance to defend themselves against this non-crime. • There is zero accountability for false accusers. In fact, the filing fee is $0! For comparison, requesting a Temporary Restraining Order in Colorado is $97. • This bill is being touted as a “suicide prevention” bill, when in fact, the fear of having your firearms confiscated will make people terrifed to ask for help when they need it. How can you help stop this bill? Attend the hearing at the Colorado State Capitol tomorrow, Friday March 15th, 9am in the Colorado Senate State, Veterans, and Military Affairs committee. Come to either show support for those in opposition, or prepared to testify with a one to three minute statement about why you oppose it. Call and email the members of that committee along with the senate president IMMEDIATELY and ask them to oppose this bill, HB19-1177. Phone numbers for each member can be found here, and please add Senate President Leroy Garcia to your phone calls: 303-866-4878. Get more information about the hearing here. RSVP for the hearing on Facebook here. 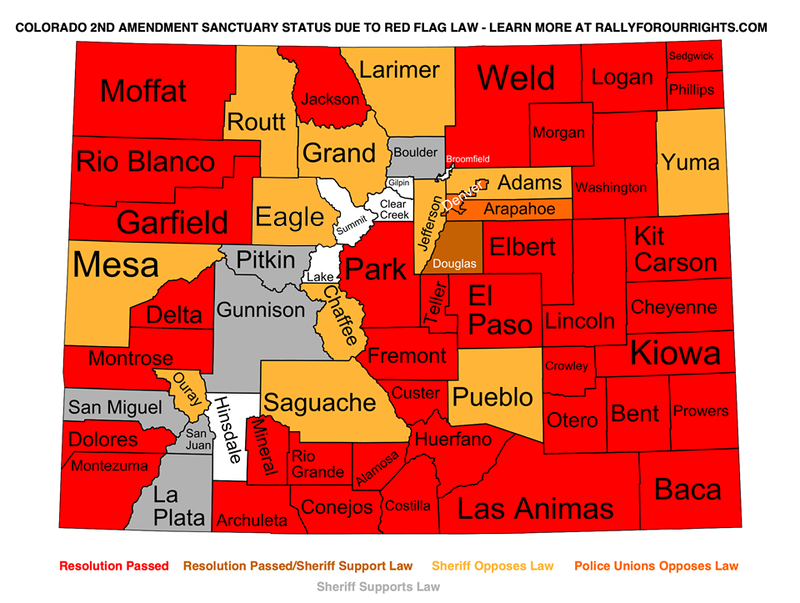 Recently we reported when two Colorado counties passed resolutions declaring themselves Second Amendment Sanctuary Counties, and since then that number has grown to over half of Colorado’s counties that have either passed a resolution or are poised to pass one at an upcoming meeting. In addition, two cities have joined with the counties – something we anticipate seeing spread like wildfire. And have no doubt, this is just the tip of the iceberg as Colorado’s very ugly version of a “Red Flag” Emergency Risk Protection Orders (ERPO) bill is being rushed through the legislature. The “Red Flag” bill has passed the state house and senate, and is awaiting the governor’s signature. Click here to contact him immediately and ask he veto this terrible piece of legislation. And then make sure to sign our petition in support of strategic recalls should this bill pass! Wondering what a Second Amendment Sanctuary County means? In nearly all of these instances, these efforts are being led by the county sheriff, then joined by the county commissioners, who say no county funds will be used to process ERPO’s or store confiscated weapons, and that the right to keep and bear arms extends to all citizens of the county. How far will YOUR sheriff go to not comply should HB19-1177 become law? Well, it varies and I’d suggest asking them yourself for more specific clarificiation. Adams County Sheriff Rick Reigenborn stated on Facebook that he has not been up to speed on the Red Flag Bill, but upon further review he agrees Sheriff Reams brings up a lot of important issues, and as written, he opposes the bill as well. He believes there are many flaws. In Eagle County the sheriff came out the day the governor signed the bill with a very thorough analysis of why he is now in opposition of the legislation as written. That can be found here. The Routt County sheriff has publicly stated that he supports the concept of a Red Flag Law, but finds HB19-1177 deeply flawed with many potential problems. The Ouray county sheriff is against the bill. In Saguache county, the sheriff has asked the citizens to contact their county commissioners requesting they pass a Second Amendment Sanctuary resolution. Grand County Sheriff is in direct opposition of Colorado’s Red Flag law, calling it unconsituational, and the county commissioners echo his concerns. They are determining what to do next. Yuma County Sheriff T.C. Combs is working with the Yuma County Commissioners to pass a resolution making their county a Second Amendment Sanctuary. They are currently awaiting legal advice before moving to the final vote. All three county commissioners support the resolution. The Chaffee county sheriff said at state senator Kerry Donovan’s town hall that he is in complete opposition of Colorado’s Red Flag bill, and he joined with the commissioners to draft a letter to the legislature pointing out 14 very specific issues with this legislation. The commissioners side stepped the issue at their recent meeting and moved the issue to a public forum. The Pueblo County Sheriff has publicly voiced his opposition and two of the three Democrat county commissioner made public statements at their last county commissioner meeting that they have grave concerns with the bill (the third was not present). Rose Pugliese, chairwoman of the Mesa County Board of Commissioners, said her board passed a comprehensive resolution in 2013 supporting the Second Amendment and she plans to present the newest resolution to the entire board of commissioners in the coming days. The Mesa County Sheriff has also come out in strong opposition to the Red Flag legislation currently being considered. In Larimer County, Sheriff Justin Smith has publicly stated his opposition to the current version of the Red Flag bill, and all three county commissioners (including Democrat and former State Senator, John Kefalas) have issued a letter to the Senate asking them to oppose this bill. Jefferson County Sheriff Jeff Shrader is also in public opposition to HB19-1177. The Board of County Commissioners have yet to make a statement. I will reach out to them as well. Did I miss any? If so, let me know in the comment and I’ll add them! Want yours added to the list? Contact your county sheriff and county commissioners and ask them what their position is on such a measure. If they support it, feel free to contact us and we can help make it happen. In the meantime, make sure you sign our petition in support of strategic recalls! Click here. 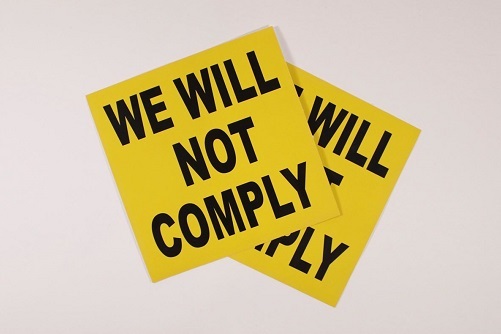 Get a WE WILL NOT COMPLY sticker with any size donation to Rally for our Rights! CLICK HERE! It’s a battle that’s playing out across the nation: states that are pushing gun control legislation directly against the will of the citizens are witnessing entire counties push back en masse. In New Mexico 29 out of 33 counties have declared themselves “Second Amendment Sanctuaries”. In Oregon, ten counties ran “Second Amendment Preservation Ordinances” on the ballot last election, and it passed in eight of them. In Washington, 20 counties have said they will not enforce the overreaching laws forced upon law abiding citizens when I-1639 passed last November. And we’re seeing it pop up other places as well, including Nevada and Illinois. 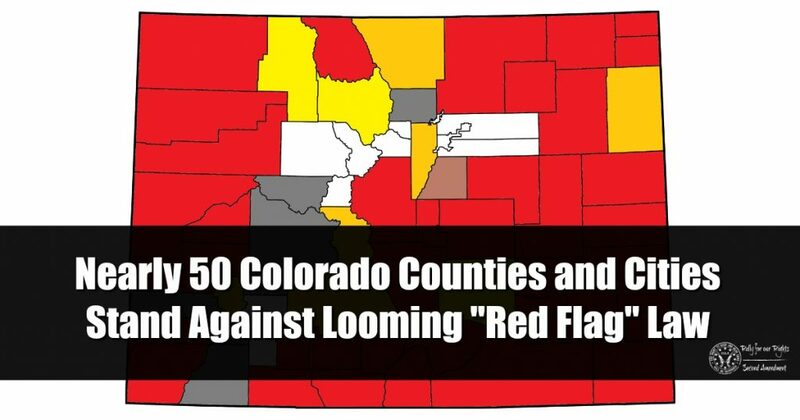 It should come as no surprise with HB19-1177 – “Red Flag” Emergency Risk Protection Orders – looming, Colorado is following suit – and the counties are adding up fast. Have no doubt, this is just the tip of the iceberg as Colorado’s very ugly version of a “Red Flag” Emergency Risk Protection Orders (ERPO) bill is being rushed through the legislature. The “Red Flag” bill has passed the state house and senate, and is awaiting the governor’s signature. Click here to contact him immediately and ask he veto this terrible piece of legislation. And then make sure to sign our petition in support of strategic recalls should this bill pass! After hours of public testimony the end of February, followed by hours of debate over amendments during the second reading last week, Colorado’s “Red Flag” Emergency Risk Protection Orders (ERPO) bill will advance Monday to a full vote of the House Chamber. From there, it goes to the State Senate where it will face a tougher battle. This bill is so horribly written it puts every gun owner in Colorado at risk. It is critical each and every person contact their State House Representatives and voice their opposition IMMEDIATELY! If possible, call and email. Then make sure to sign our petition in support of recalls should this bill pass. When contacting your legislators, be aware not all of them are in support of this bill. Be respectful, be firm, and make your point by stating your position and/or any personal accounts you want to add. Here is a quick template message that can be used or changed. I am writing to ask that you vote NO on HB19-1177: Emergency Risk Protection Orders. I oppose this bill because it puts every gun owner in Colorado at risk. The extremely low threshold of evidence needed to obtain the temporary ERPO, along with the $0 cost and the ability to petition over the phone without even providing an address, is downright dangerous. It would allow for vindictive ex’s and roommates to make false accusations – people who are somehow included in the bill’s definition of “family or household member”. This could lead to those needing protection the most, being disarmed, and also opens up opportunity for it to be used as a “hate crime” against minority groups. With a search warrant being issued with the temporary order, this law would create a dangerous situation where children and other family members may be present. It also puts law enforcement in harms way as they are required to confiscate the firearms of people who have committed no crime and could easily be innocent. And it is absolutely appalling the initial hearing is ex-parte while allowing for such a low evidentiary threshold to issue the order and search warrant. Lastly, this bill is being promoted as suicide prevention while there is nothing in it about mental health, and removing one tool of self harm does nothing to help the person. In fact, creating a scenario where police are raiding the homes of those who may be suicidal will only exacerbate a suicidal situation. Or use this easy copy/paste list to email all 65 legislators in state house. 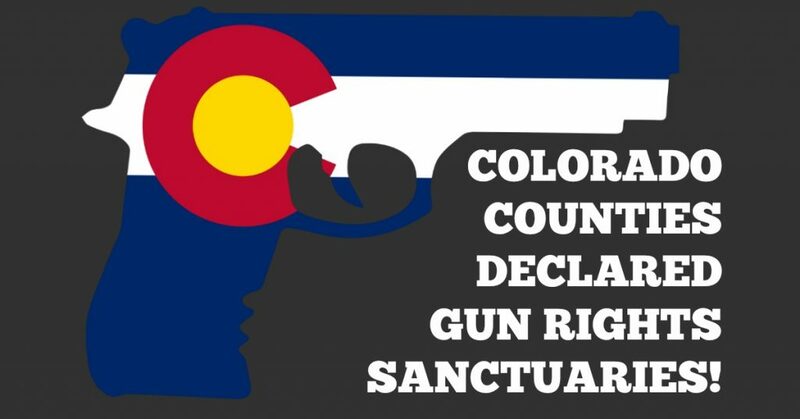 Early Tuesday February 26th, two separate Colorado counties voted to declare themselves Second Amendment Sanctuary counties. Both Fremont and Montezuma counties held their regular Board of County Commissioners meetings and either passed or started the process to pass resolutions stating if Colorado’s HB19-1177: Emergency Risk Protection Orders (ERPO) is passed into law, they will not enforce it. HB19-1177, which is Colorado’s proposed Red Flag gun control legislation passed the House Judiciary Committee last Thursday after nearly ten hours of testimony for and against. Dozens of those wishing to testify in opposition to the bill had already left when they were called up to testify at 9 and 10 o’clock at night. Many of those who were not able to speak had been there since noon. In Fremont County, Chairman Dwayne McFall led the initiative in direct response to HB19-1177, which he says violates multiple Constitutional amendments. In Montezuma County, more than 100 people attended and many shared their comments about the Red Flag legislation being considered. The Board of County Commissioners were said to be transparent and shared a copy of the resolution with those in attendance indicating the county’s position against a Red Flag ERPO law, calling it a dangerous infringement on the Second Amendment and civil liberties. Montezuma County Sheriff, Steve Nowlin, was also in attendance and supported the resolution. The final draft of this resolution will be discussed in a Special Meeting on Thursday, February 28th at 6:30 p.m. The public is invited. Many other sheriffs in Colorado — including El Paso County Sheriff Bill Elder, Weld County Sheriff Steve Reams, Teller County Sheriff Jason Mikesell, and Fremont County Sheriff Allen Cooper — say they don’t approve of the bill as written because they believe it infringes on citizens’ rights to due process. Even Democrat Sheriff out of Pueblo County, Kirk Taylor, says he doesn’t believe there are adequate due process protections for gun owners in this year’s version of the bill. 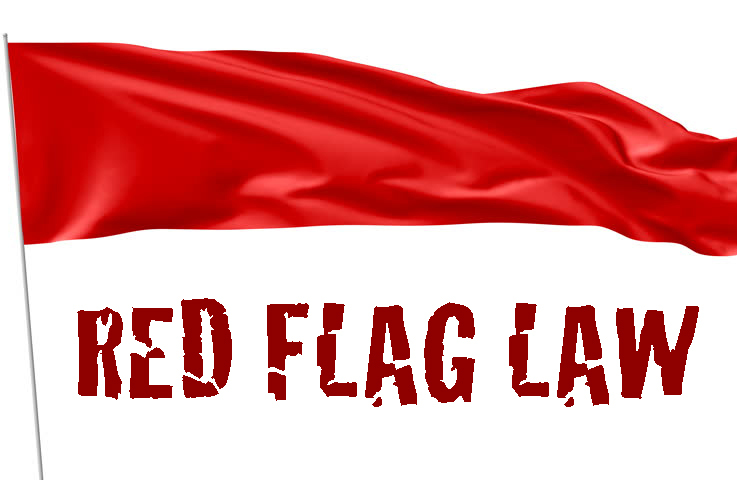 Colorado’s proposed “Red Flag” legislation is one of the worst the U.S. has ever seen. This year’s bill is being called an “Emergency Risk Protection Order” or ERPO in an attempt to lose the negative “Red Flag” reputation. It is also being pushed more than ever as being about suicide prevention. Don’t let any of it fool you. The devil is in the details; it’s in the 30 pages of bill language. You can read a complete break down of these 30 pages here, as well as watch a video going through the language line by line. I attended the hearing last week to testify in opposition to this bill. I arrived at noon and was the very last person to be called to testify – nearly ten hours later. After listening to testimony all day, I decided rather than once again testify to how unconstitutional the bill is or how it lacks due process, I’d instead testify to my own experience having the legal and judicial system used against me as an act of harassment during a 22 months custody battle. Ready to recall?? Sign our petition in support of recalling if and when the need arises. CLICK HERE TO SIGN PETITION. On Monday Feb 25th, journalist Anna Staver over at the Denver Post released an articled titled “What Colorado can learn from “red flag” gun laws in other states as lawmakers debate passing their own version”. This article discusses how the opposition and support for Colorado’s proposed “Red Flag” Emergency Risk Protection Orders (ERPO) bill varies, as well as goes into some detail about the effects of this law on other states. The bill being considered in Colorado, HB19-1177, passed the State House Judiciary Committee last Thursday after nearly ten hours of testimony for and against it. The opposing sides continued to testify well into the night, with dozens of gun rights activists being called well after they had left. Had they all stayed, testimony undoubtedly would have continued into the early morning hours. The bill will be heard in the House Appropriations Committee this week where no public testimony will be taken, and it is expected to pass. It could see a vote of the full House Chamber as early as next week. Suicide is the leading type of gun death in the United States, according to the Centers for Disease Control and Prevention. And supporters of Colorado’s extreme risk protection order bill claim it would prevent some of those deaths from happening in the Centennial State. The data supports Sullivan’s assertion that if Colorado allows extreme risk protection orders, the majority of cases will involve suicidal ideation. About 80 percent of the gun seizures in Indiana and 60 percent in Connecticut arose from concerns about suicide. But did removing those guns prevent violent self-harm? Aaron Kivisto, a professor of clinical psychology at the University of Indianapolis who studied suicide rates in both states, said the answer is yes in Indiana and no in Connecticut. But he found something else in Connecticut: An uptick in non-firearm suicides meant the overall suicide rate was essentially unchanged. He said he doesn’t know why the two states got two different results, but one possible explanation is the cultural differences between them. Rally for our Rights supporter and gun rights activist, Mario Acevedo of Denver, thought the Indiana numbers didn’t seem accurate. So he did his own research. He found that not only were Ms. Staver’s numbers inaccurate, but they were wrong on the white paper she referenced. Here’s the letter Mario sent to Ms. Staver and the Denver Post. I repeated the same research Mario had done on the CDC’s website and came up with exactly the same numbers he did. 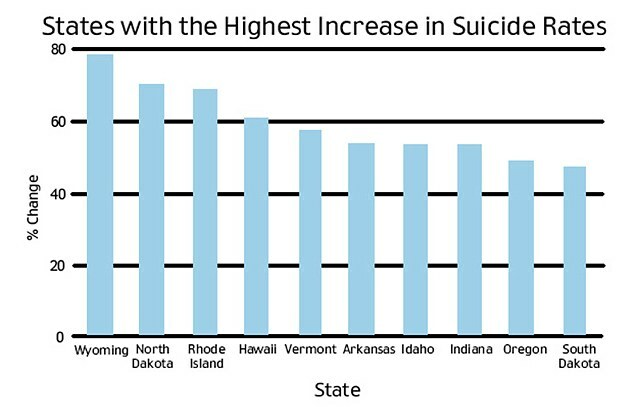 Indiana has one of the fastest increasing rates of suicide in the nation. In 2005, Indiana had 416 gun suicides, 745 total suicides, and 11.82 suicides per 100K population Age Adjusted Rate. In 2017, Indiana had 604 gun suicides, 1092 total suicides, and 16.36 suicides per 100K population Age Adjusted Rate. I don’t know what numbers or methodology Kivisto was using but his findings appear to be completely bogus. You are more than welcome to confirm my numbers at the CDC WISQARS Fatal Injury Reports. My issue with red flag laws is that there’s a lot of hand waving over the results that cause me to question the purpose of such law. Effective policy, in this case to reduce fatal self-harm, must be based on reality and facts, not simply good intentions or wishes. Think they’ll bother to do the research themselves and correct this glaring inaccuracy? We really shouldn’t have to fact check the fact checkers. Mario also contacted the author of the white paper, Aaron Kivisto. Mr. Kivisto did respond! But his response gave us a big WTF? Basically they decided the rate of suicide has decreased because it’s lower than what the projected rates were had the bill not passed. Do these people have a crystal ball? Thanks for your email. You’re absolutely right that in absolute terms suicides have increased. Our study approached the issue not in terms of absolute reductions, however, but in terms of reductions from the number of suicides that would have been expected in each state had the lot not been passed. In other words, our statistical approach utilized a technique known as the synthetic control methodology. It’s an approach developed by MIT economists to study the effects of policy changes and is currently considered among the most robust methods available to study the impact of policy change. In short, the approach provides a counterfactual – that is, an estimate of what the suicide rate would have been in Indiana had they not enacted the law, as well as in Connecticut had they not enacted the law. These estimates are compared to observed rates, and reductions represent the difference between these estimated and observed values. The apparent contradiction you were noticing comes from the fact that suicide rates can indeed rise, but not rise at as rapid arete as would be expected. Similarly, there could be an absolute reduction in suicide rates, but a reduction not as fast as would be expected, which would be interpreted as a problematic impact. We here at Rally for our Rights certainly don’t take suicide lightly. In fact, many of us including myself and Mario have lost loved ones to suicide. It’s an issue near and dear to our hearts. Which likely makes this even more infuriating. Suicide is a serious problem in society and manipulating stats to pass bad legislation is despicable. Watch this testimony given by 19 year gun rights activist, Haley Marcantonio, during the Red Flag ERPO hearing last week. What she doesn’t mention in her testimony is her family has been personally touched by suicide, as many of ours have. The anti-gun community does not get a monopoly on suicide. This issue has touched millions deeply. Democrat state lawmakers have introduced a Red Flag Emergency Risk Protection Order (ERPO) bill into the 2019 Colorado legislative session. This bill, HB19-1177, which was introduced Thursday, February 14th, is far worse than a previously introduced bill which died in 2018. Question everything you hear the media say about this legislation. The devil is in the details. A family member or law enforcement officer would petition a court to request the ability to immediately seize a person’s guns. If a judge signs the order, the weapons can be taken away and the court must hold a hearing within 14 days to determine whether to extend the seizure and bar the person from purchasing more firearms. The longest a judge could order the seizure of firearms is 364 days. The entire process is a civil, not criminal, proceeding. Who can petition the courts? According to the bill summary and media reports, only family or household members, and law enforcement can petition the courts. But what is the definition of “family member” and “household member”? Say what?! This is who they define as a “family member” or “household member”? This person doesn’t need to be either a family member or a household member. We’re talking scorned ex’s, those pretending to be scorned ex’s, angry former roommates, those in custody disputes, and so on. And that’s not even touching on law enforcement’s ability to petition for an ERPO. Co-worker mad? All they have to do is make a report to the police that you’re a danger to yourself or another, and they can have your firearms confiscated. What is needed to file the ERPO petition? The filing of the ERPO petition can be done either in person or over the phone. The petition must be filed in the county court of where the accused lives – but since the petitioner can do it over the phone, they don’t even need to be in the same state. There is NO filing fee. The petitioner even has the option to not provide their address – for safety, of course – never mind the address could simply be left off any actual order as they do with temporary restraining orders. Questions that will be asked on the petition include how many firearms the accused has, what types, and where the are located. This doesn’t only include ownership – it also includes possession, custody, or control. Petitioners are also asked to disclose if there are any other legal actions pending between parties, such as: current restraining orders, lawsuits, civil suits, custody cases, etc, but the existence of such cases shall not delay or prevent an ERPO from being granted. And finally, no one is required to tell the accused that a petition is being filed or has been filed. What happens after the ERPO petition is filed? Once an ERPO is filed, a hearing will be set either the same day or the next day. Once again, the petitioner does not need to be present. They can attend this hearing over the phone, while never being required to show proof of any relationship to the accused, and not even provide their address! At this hearing, the petitioner will be asked to provide a “preponderance” of evidence with the goal being to convince the fact finder judge that there is a greater than 50% chance that the claim is true. Now, remember, this is over the telephone. What kind of evidence are they looking for? A recent act or credible threat of violence, even if such act does not involve use of a firearm. Self harm or threats of self harm within the past year. A prior violation of a protection order. A previous ERPO. Prior domestic violence convictions. Prior ARREST, not even conviction, of a whole host of other crimes. Ownership, access to, or intent to purchase a firearm. Drug or alcohol abuse. Recent acquisition of a firearm or ammunition. How do you provide this evidence during a telephone hearing? At this hearing the court will either approve or deny the ERPO. If it is denied, they must document reasoning for denial. Judges will err on the side of caution. Once the ERPO is approved, a warrant to search the home for weapons is also issued. All while the only person who has no idea this is happening, is the person being accused of no crime. How will the ERPO be enacted? Once the ERPO and warrant are in hand, it’s time for the police to take action. Considering we see SWAT teams show up to homes where someone is reported to possibly be suicidal, it won’t be pretty. The county sheriff is required to work with city police. They will show up at the door without so much as a warning, manually deliver the order, ask the accused to surrender their firearms, and if they refuse or claim to have none, they will search the home. Honestly, even if firearms are surrendered, they will likely STILL search the home. Did the petitioner make claim you have firearms at a place of business? Expect that location to be included on the search warrant. During this interaction, law enforcement is required to determine if the accused should be put into a 72 hour involuntary commitment hold. It is not unlikely children, spouses, even co-workers will be present during these raids. Once the firearms have been confiscated, the accused will be asked if they’d like to sell them, store them with law enforcement, or store them with a FFL. The accused’s information will also be added to the CBI and NICS database prohibiting them from purchasing guns. Along with the order that will be delivered upon the accused, a court date for 14 days later is given. This will be the first opportunity the accused will have to speak on their own behalf. What happens at the 14 day ERPO hearing? Prior to the hearing, the court will appoint an attorney or the accused can obtain their own or they can proceed self represented. Because no one has been charged with a crime, these are civil cases, not criminal. This means public defenders are not used, but instead the state would appoint one from a pool of attorneys who have agreed to work these cases. These are not provided at no cost – unless you qualify as indigent according to the court. It is unclear what the cost will be. During this hearing the petitioner and the accused will have the ability to provide evidence, call witnesses, cross examine witnesses, etc. The petitioner does not need to be present, and can provide sworn affidavits. At the end of the hearing, the judge will either dismiss the ERPO, and the firearm rights of the accused will be restored and their guns returned. Or the temporary ERPO will become a permanent ERPO. This would mean it will remain in effect for 364 days. The judge has the discretion to schedule hearings sooner than the 364 days if he or she believes the order should be lifted sooner. The accused also has ONE opportunity during that 364 day period to request a hearing. If they do request a hearing, the petitioner is alerted and that person can request it be denied. What happens when the 364 days is up? Any person who has in his or her custody or control a firearm or purchases, possesses, or receives a firearm with knowledge that he or she is prohibited from doing so by an ERPO or temporary ERPO is guilty of a class 2 misdemeanor. What can you do to help stop this? Contact your state lawmakers and urge them to oppose this legislation. CLICK HERE for information about who to contact. Watch the video below as we go line by line through this 30 page bill and highlight everything stated in this article. Ready to help us fight this ERPO bill in Colorado? Donate here. And get connected by subscribing to our email list and following us on social media. Find us on Facebook, Twitter, Instagram, YouTube, and we even have a private Facebook group where you can connect with fellow gun rights activists. Today marks one year since the United States saw a school massacre that broke the hearts of a nation, ignited a fire in new activists, and if you’re paying attention – shattered your trust in government. That massacre being the Parkland, Florida school shooting where 19 year old Nikolas Cruz took the lives of 14 classmates and three teachers. On February 14th, 2018 Nikolas Cruz took an Uber with a backpack equipped with an AR-15, grenades, and ammo to his old school. He walked past the school security monitor, Andrew Medina, who knew he wasn’t allowed on school grounds and found his presence “suspicious”, although did nothing. Cruz walked past the building where school resource officer, Scot Peterson, was talking with another student. Peterson was employed as a sheriff’s deputy with the Broward County Sheriff’s Department, but his charge was to protect the students at Parkland High School. It should also be noted that Peterson was the only armed person permitted to be on school grounds. Cruz walked through the unsecured school doors into his former high school from which he’d been expelled. In this gun free zone not one person attempted to stop him, nor was there any security measures in place. At 2:21 pm he opened fire. It was a rampage that would last at least 20 minutes before Cruz simply walked out of the school and into a nearby neighborhood, where he was eventually captured and confessed. Heartbreaking. How can this kind of tragedy happen? It shouldn’t have. And it wouldn’t have if the government had done their job. The Parkland High School Shooting spurred a gun control movement this country hasn’t seen in decades. March for our Lives formed under umbrella groups Moms Demand Action and Everytown For Gun Safety, all which are funded by Michael Bloomberg, have taken to the streets and the halls of congress. Frantic and misguided students, parents, teachers and individuals have exploited the Parkland tragedy calling for massive gun control across the nation – from city ordinances to federal laws. 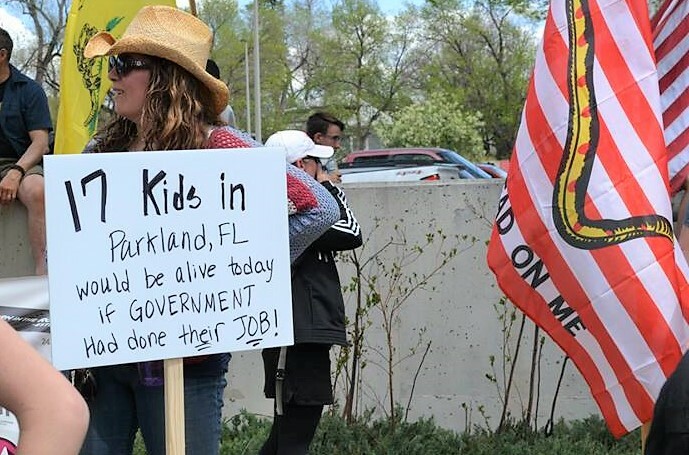 What they should be acknowledging instead is the complete and utter government failure that allowed Parkland to happen in the first place. More laws were not needed. The current laws simply needed to be enforced. The government has blood on their hands, and as a mother I say that unapologetically. • Nikolas Cruz was not a stranger to Broward County law enforcement. In fact, police had been called to his home at least 37 times over the course of only a few years. 37 TIMES! The reasons ranged from harming animals (shooting chickens with a pellet gun), assault on his mother, assault on his siblings, harming himself, threatening to harm himself, threatening to harm others, and more. Not once was he charged. Not once did the police take any action, even though action on almost all of these would have required his name to be entered into the NICS database preventing him from legally being able to purchase a firearm. • In addition to the 37 reports law enforcement did follow up on (although ultimately ignored in the end), in February 2016 a tipster called Broward Sheriff’s Office to say Cruz ‘could be a school shooter in the making’ and had been making threats on Instagram, but deputies did not write up a report on that warning, instead they forwarded it to School Resource Officer Scot Peterson. That report came just weeks after a relative called urging Broward Sheriff’s Office to investigate if he should have the weapons he had, and possibly seize them. In the end, both reports were ignored. • Late in 2016 a “peer counselor” reported to School Resource Officer Scot Peterson that Cruz had possibly ingested gasoline in a suicide attempt, was cutting himself and wanted to buy a gun. A mental health counselor advised against involuntarily committing Cruz. In Florida, such action can be done under the Baker Act, which allows the state to involuntarily commit individuals deemed a threat to themselves or others. People committed under the Baker Act are legally barred from obtaining firearms. This event was followed up on by Florida Department of Children and Families, and even though he had fresh cuts from “cutting” and his mother shared her fear that he constantly talked of wanting to buy a firearm, he was deemed stable and, once again, ignored. • In September 2017 a YouTube user named “nikolas cruz” postsed a comment stating he wanted to become a “professional school shooter.” The comment was reported to the FBI in Mississippi, but was not followed up on. • In November 2017 a family member called Broward County Sheriff’s Office to report that Nikolas Cruz was dangerous, had made legitimate threats, and had weapons. Her concerns were ignored when Cruz told them he’d give the weapons to a family friend. This again would have been a legitimate use of the Baker Act. • Also in November 2017, after Cruz’ mother died, he was taken in by a Palm Beach County family. They contacted the Palm Beach Sheriff’s Office to report a fight between Cruz and their 22 year old son. A member of the family said that Cruz had threatened to “get his gun and come back” and that he had “put the gun to others’ heads in the past.” The family did not want him arrested, so the report was ignored. • And again in November 2017 a caller from Massachusetts reported that Cruz is collecting guns and knives and was threatening to be a “school shooter in the making.” A Broward County Sheriff’s Deputy advised the caller to contact the Palm Beach sheriff. If the caller ever did contact Palm Beach, it’s not on record. • In January 5, 2018 a report came in to the FBI’s tip line claiming that Cruz has “a desire to kill people” and could potentially conduct a school shooting. The information was never passed on to the FBI’s office in Miami. The FBI has even publicly acknowledged their failure. • The only other armed person on school grounds, resource officer Scot Peterson, hid behind a concrete wall during the rampage. • School Security Monitor, Andrew Medina, had a long history of sexually harassing female students, all which was swept under the rug. • Broward County Sheriff took 26 minutes to enter to the school. • Nikolas Cruz was easily able to walk out of the school, blending in with other students and walked into a nearby neighborhood, where he was later arrested. • After a lawsuit against the Broward County Sheriff’s Department, the school district, and Parkland High, a judge determined that NONE of these entities had a responsibility to protect the students. You would think after all of this, those closest to the tragedy would be asking why – and how – this kind of failure is possible. You would think that in the change they wish to see, the government would be the last place they’d be seeking it. I mean, what makes them think anything will change? History shows it won’t and it doesn’t, and, in fact, nearly every mass shooting the US has seen government failure like this exist behind it. Even last summer during a counter protest Rally for our Rights held while March for our Lives was staging a “March on the NRA”, a conversation afterward between myself and the organizers of the other event resulted in agreement that these failures exist, and that before we discuss new laws, we should be discussing why our current laws are failing. What is the solution? We need to acknowledge our society has a violence problem and a suicide problem, but to call it a gun problem is disingenuous. To create gun control laws that disarm and effect only the law abiding is a false sense of security. Mental health is a strong component of this issue. Any individual who will walk into a school and execute students is mentally ill, even if not previously diagnosed. We have soft targets in schools such as Parkland, where someone like Cruz can simply wander in with nothing in his way, and not one person inside the school is legally given the ability to defend the students they care for as their own. Programs such as FASTER Colorado provides no cost or low cost intensive training to school staff who voluntarily choose to be armed and is approved by their school board. They are also provided with deep concealment training, trauma training, and psychological training. In the end, we will never eradicate evil, but we can defend ourselves from it. Red Flag ERPO Bill Passes Colorado State Senate BY ONE VOTE! MUST WATCH! CO State Senator Kerry Donovan Is Called Out By Her Sheriff Over RED FLAG BILL And Loses It On Constituents! 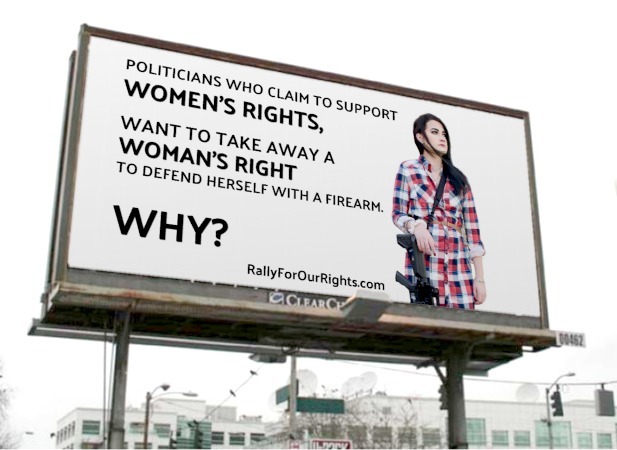 Ready To Defend Your Rights? Subscribe to our Updates!